"I was listening to your presentation the other week and tried out one of the ways of making a photo stand out," said David Hunt. "This example was to get in close." 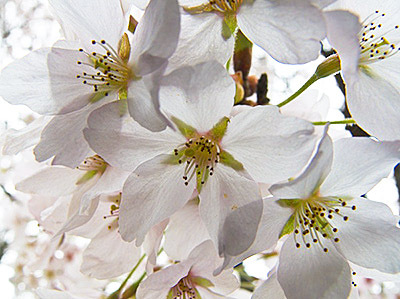 "So I looked up my camera manual on how to take macro shots, and came up with this shot of cherry blossoms. Camera was an Lumix DMC-FZ50, f/5 at 1/200, ISO 100." "I also just received your new book, The Digital Photography Companion, and will be putting in to use right away. Thanks for all the inspiration and insights into photography." Thank you David, and what a terrific shot. Just as an exercise, compare this image to shots in the past of similar subjects. I think you'll be thrilled with the difference. I have got my copy of the Digital Photography Companion. I've been trying to put it into use (I have read it cover to cover in the last 3 days during my breaks from work - an heroic feat if only you knew what my week has been like). Unfortunately, I need to get a new set of rechargeable batteries before I can continue... my fault I should have been better prepared - the current set of batteries being several year old. OTOH - it gave me time to get through the book. In advance then, I thank you for the excellent advice. I may be able to finally figure out this camera (Nikon Coolpix L12) - which would be an excellent thing. I believe if I can take good pictures with that, I can take good pictures with any camera!